Penelope (Lo) Marin has always loved to collect beautiful things. Her dad’s consulting job means she’s grown up moving from one rundown city to the next, and she’s learned to cope by collecting (sometimes even stealing) quirky trinkets and souvenirs in each new place—possessions that allow her to feel at least some semblance of home. But in the year since her brother Oren’s death, Lo’s hoarding has blossomed into a full-blown, potentially dangerous obsession. She discovers a beautiful, antique butterfly pendant during a routine scour at a weekend flea market, and recognizes it as having been stolen from the home of a recently murdered girl known only as “Sapphire”—a girl just a few years older than Lo. As usual when Lo begins to obsess over something, she can’t get the murder out of her mind. 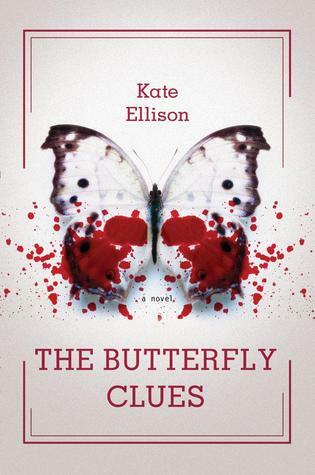 As she attempts to piece together the mysterious “butterfly clues,” with the unlikely help of a street artist named Flynt, Lo quickly finds herself caught up in a seedy, violent underworld much closer to home than she ever imagined—a world, she’ll ultimately discover, that could hold the key to her brother’s tragic death. This mystery who-done-it story was the first novel written by author Kate Ellison. Before my review, I must say that Kate’s writing is unique, beautiful, and perfectly descriptive. Each setting within each scene came alive without her overdoing it. Many authors go on and on for paragraphs about what things look like and so on, and tend to lose me. I love being absorbed into the settings of the books I read, but it is a very hard balance to achieve. Too much and it seems like the author is droning on and on and seems fake. Too little and the reader can’t feel like they are living within the story. Kate, to me, has mastered the act of saying just enough. In just a few sentences I feel as if I am there myself. She also knows how to show and not tell! Another problem I have with authors is when they are always saying: “She felt sad” “I am so angry” “She had never been so happy”. I mean, yeah that’s great, but it is so much better to show that feeling. Kate has seemed to be able to use your first person POV of the main character “Lo” along with the setting surrounding her to show what she is feeling. Kate’s great writing starts at the very beginning of the book, and is honestly the main reason why I picked it up at the library. Even though I didn’t love-love this story, I will probably always pick up anything written by this author. Now, on to the review! I must say that I have NEVER read characters like these. It is SO refreshing to read a YA female protagonist that isn’t all dramatic and weepy. The main character you follow is a girl named Penelope or “Lo”. What made this character so different was that Lo had OCD or Obsessive-Compulsive Disorder. When I started reading I thought that her OCD would be what the story would be about. But to my surprise, although her problem is a constant throughout and interwoven in the story, the plot didn’t surround her Disorder. It was written artistically as a character trait that influenced many aspects of the main characters life. The murder mystery and other events that occurred during the story illustrated the disorder well without this seeming like a self-help book. Even though it was Lo’s OCD that influenced her pursuit of the murder mystery, this book was written not as a book about OCD, but as a murder mystery that sheds some light on living with OCD. The first would be easy to write, strictly upfront with dramatic and emotional scenes. The second, involving OCD within a bigger story takes much more ability of showing and not telling, as discussed before. The author wrote Lo’s compulsions perfectly so each time Lo had to perform one of these it felt real and honest. You could feel the main characters need beyond all else to perform these compulsions. I can see how exhausting and frustrating it must be to have to live with this disorder. The only other real character in the story is Flynt, the homeless artist love interest. As a reader, I want to not only see the main character fall for the boy, but I want to fall for him also! And I just didn’t like Flynt that much. Yeah, he was kind and sweet, but he was also guarded and had too many mood swings. You do learn a little about how and why he became homeless, but I still feel lost as to who he was. He never felt like more than a caring stranger to me. It always felt a little odd that Lo spent so much time with him. He is not the most honest and to me just feels sort of spotty. Honestly, if it were me I wouldn’t trust him. Not because he is homeless, but because I just thought he was a little creepy acting. Yes, he was drastically different from any other male love interest in YA, but he just wasn’t my thing. I can’t really say more without revealing some of the plot, so that’s all I will say. The third, sort of character is Sapphire, the murdered stripper. The murder mystery surrounding her just wasn’t enough. I saw everything coming, which was why the story got only three stars. I also feel as if the author could have led us to get to know Sapphire and who she was much more. It was almost there, but just not quite. I feel the parallel between the main character and Sapphire could have been used so much more. I would have loved to feel like I not only know Lo by the end, but also Sapphire. The murder mystery plot was quite similar to other stories of this type. I hate to say it, but I saw every turn coming even from the beginning of the story. The limited number of characters left really no options as to who could have done it. It was quite obvious to me throughout the book. For me, the similarity and predictability of the plot is where this book was lacking. Which is so frustrating to me, because the author could write so beautifully! I tried so hard to not predict what was going to happen, but I found myself getting so bored and sleepy because of it! The characters and the writing discussed above were the main differences in the story. Both were so refreshing and creative. The story takes place in Cleveland. The author shows the realistic differences between the good parts of Cleveland, where the main character lives, to the bad parts of Cleveland, where the main character visits. Contemporary. The whole plot seems to happen very fast and in not along period of time. Obviously, I loved the artistic writing of the author, but was very bored with the plot. I wanted to like this story more so badly, but just couldn’t give it more than three stars. The author’s beautiful writing was the redeeming quality, but I just wanted more. To me, this book is definitely one that I am glad I didn’t buy and just got from the library. The cover is awesome, but I would probably never reread this. Although I didn’t love this book, I can’t wait to read something else by Kate Ellison.